I fished in Alaska from the time I was seventeen until I was well into my forties, and across all those years, one of the things that most impressed me is the way our "Last Frontier" continues to fire young people's imaginations. Just as it famously did during the Gold Rush, Alaska still lures the restless, the unorthodox, and the ambitious. The good news is that it still rewards them with amazing adventures, great financial opportunities, and lifelong friendships. Friendships forged through shared adventures and challenges well-met. I was fortunate enough to grow up in Seattle, Washington, "the upper-left-hand corner" of the United States. For me, Alaska was less of a distant dream than it was for kids from Maine, Florida, Arizona, or Texas. Some of them still made it up there, of course, and I even met crew members from as far away as Wales and Israel during my time on Alaskan fishing boats, but these were truly exceptional people; unorthodox in the extreme, you might say. Exceedingly restless. But what about recent high school graduates just looking for a start or college students who need to pay tuition and buy books to further their dreams? What about all those millions of people who watch "Deadliest Catch" on the Discovery Channel and suddenly feel the pull of the sea? A lot of them think about heading up to Alaska to work on a fishing boat, too. They have some vague concept of fantastic scenery and big money, but they don't have any idea how to proceed. If you're one of those people, how do you go about getting to Alaska and making some money? Well, you could do it the way I did. You could scrape together twenty-six bucks and hitchhike up through British Columbia, accepting rides from mobsters and religious zealots. Sleep under picnic tables. Catch a ferry to Southeast Alaska with ten cents left over. Walk the docks aimlessly, then eventually get hired on a fishing boat without even knowing what kind it is. You could do it that way, but I don't recommend it. What I do recommend is that you check the Internet to see if there is some way to connect with fishing boat captains before you head north. 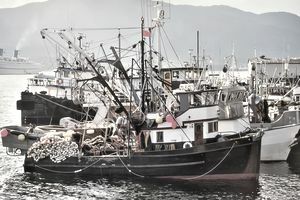 If you look in the right places, you can find realistic information about the work and the risks involved in commercial fishing, as well as the substantial rewards. The Alaska Job Center Network has detailed information on seafood harvesting jobs and the companies that hire for fishing industry positions. So, what is it like to work on a fishing boat? Well, the first thing to understand is that Alaska has over 9,000 miles of coastline, and thousands of fishing vessels operate there, going after a wide variety of seafood and shellfish species. From 28-foot salmon trawlers that drag weighted lines and baited hooks in a low-tech fishery aimed at catching one beautiful fish at a time, to giant "factory trawlers" whose nets are big enough to swallow the Astrodome, to those crab boats made famous on the Discovery Channel's "Deadliest Catch" program, there's no simple answer to the question of what life is like on a fishing boat. However, I can tell you about one of the most common entry-level gigs you can land in Alaska; a summer job on a salmon boat called a purse seiner (pronounced "say-ner"). It is the way I started out. The maximum length for purse seiners in Alaska is 58 feet. It is a state-mandated size limit meant to prevent excessive fish-catching efficiency among the fleet. Since the boats are relatively long and wide, they are usually quite comfortable. Purse seiners are readily distinguishable by their rigging. Purse seiners have a heavy mast, from which projects a boom, extending aft vertically and diagonally over the work deck. From the boom hangs the power block, a hydraulically driven drum that retrieves the net from the water. One of the best sources of fishing jobs in Alaska is the Alaska Job Center Network’s ALEXsys Job Bank. The site also has a list of job fairs, recruitment events, and workshops for job seekers. If you're in Alaska, you can visit a job center for assistance. Searching Google will bring up a variety of fishing and processing employment resources and job postings, including jobs on Indeed.com, jobs posted by employers, and job sites that focus on jobs in Alaska. While you’re reviewing jobs, be aware of the responsibilities of each crew member as outlined below, so you fully know what the job entails and what you’ll be doing if you’re hired to work on a fishing boat. Purse seiners typically have a crew of five, including the captain. Everyone is expected to pitch in whenever and wherever there is work to be done, but certain specialized tasks usually, but not always, fall to crew members with prior experience. The skiffman drives a high-powered work skiff, which pulls one end of the purse seiner net as it enters the water and corrals the catch. He works closely with the captain, who communicates with him by radio about maintaining the "shape" of the net. The engineer, usually a returning crew member or a "greenhorn" with mechanical experience, is responsible for keeping the engines and machinery in good working order. A greenhorn is a new and inexperienced crew member. Always remember that every crew member and captain in Alaska was once a greenhorn. Greenhorns are usually assigned the role of a deckhand. Deckhands do a little bit of everything and are expected to display initiative and a willingness to learn at all times. Stacking the net as it comes aboard; repairing the nets and other equipment as they wear and tear; pitching fish into the fish-hold; unloading the catch at the end of the day; standing wheel-watch; and helping keep the boat clean are a few of the countless tasks that will be learned by the enterprising deckhand. Compared to jobs on crab boats or halibut boats, a workday onboard a salmon seiner is like a walk in the park. Depending on your previous experience, however, it may be the most demanding walk you've ever taken. The days are long. If fishery managers give the fleet a four-day opening, this means the fishery will be open for ninety-six hours straight. Your captain, unless he is very unusual, will always seek to maximize the catch during openings. That means fishing from first light until dark. Most seining is done very close to shore, where schools of migrating fish appear in the greatest concentrations. While the crew checks the deck and equipment for readiness, the captain studies conditions of the tide and current, light, the wind, and observable fish behavior to determine where he will make his set. At this point in the operation, the skiff is attached to the seiner's stern, and the skiffman is at his steering station in the skiff, with the engine running in neutral. Arriving at his chosen spot, the captain signals the crew to release the skiff. Once released, and pulling one end of the net, the skiff turns and motors into position, usually facing and quite close to the rocky shoreline. The captain drives the seiner away from the skiff, and the quarter-mile-long net pays out over the stern. As the last of the net slides off the seiner's stern, the captain slows the boat and begins to tow slowly against the current on his end, holding the net in a generally semicircular shape. Purse seiner nets are constructed in three main parts: a corkline along the top, strung with buoyant floats called “corks”; the webbing (also called the “mesh”) of the net itself below the corkline; and a heavy leadline (a thick nylon line with chunks of lead woven into it) at the bottom. The corkline floats on the surface of the water, the web hangs down in the water like a fence, and the weighted leadline keeps the "fence" hanging more or less straight down in the water. The tow lasts about twenty minutes, during which time the crew throws any fish remaining on deck into the hold and hoses down the work area to clear it of seaweed and jellyfish. There are usually a few minutes to relax and grab a sandwich or cup of coffee below deck during tows. During the tow, the captain and skiffman are holding the net open, so fish can swim into it. At the end of the tow, the captain tells the skiffman, by radio, to "close-up." Hearing this, the deckhands and the cook scramble back into their rain gear and gloves so they can "haul gear." The skiffman closes the circle of the net by driving alongside the seiner and handing off his end of the net to the deck crew. He then drives out under the towline attached to the seiner. Circling to the other side of the seiner, he attaches another towline to the "big boat," which he will pull on with the skiff to hold the seiner in proper relation to the net as it comes back aboard. When the net is "closed up," it hangs like a big circular corral in the water. The fish that swam into the net during the tow are now caught, but they can still escape by diving, since the bottom of the net is floating, not resting on the bottom. To prevent their escape, the crew "purses" the net closed, using a large winch mounted on the seiner's deck. Visualize a long drawstring closing the bottom of a giant mesh bag. That's what pursing is. Once underway, it is time for the net to come aboard. The power block does the heavy lifting in a seiner operation, pulling the net out of the water and over the deck. After the net passes through the power block, it is lowered toward the work deck, where two or three crew members stack it in a pile. The fish come aboard in the last part of the net and are emptied either onto the deck or directly into the hold. Hauling gear takes about 15 minutes for most seiners today. An efficient crew on a well-equipped purse seiner can complete 15 to 18 sets per day. So, that gives you a glimpse of what it’s like to live and work on a fishing boat in Alaska. It’s not for everyone, and I am biased, but I think it’s the greatest summer job in the world. It's been about thirty years since I first went north, and I'm glad I did. After that rocky start, my dreams of beautiful country and good money came true every season I spent there, from Ketchikan to Nikolski, from Naknek to Dutch Harbor. It’s a profoundly beautiful place, Alaska, and it’s still the purest, closest thing we have in this country to a “land of opportunity.” Most importantly, it’s still big enough for a lot of dreams. Maybe yours. Someone once said that “luck is what happens when preparation meets opportunity.” So, find yourself an online resource that can provide both of those things, and you’ll have a good shot at making your own kind of luck in Alaska. And always – as I used to tell my crew at the start of every season – be smart, be safe, and good luck!